In Guelph and the surrounding area, there are a number of Montessori schools for parents to choose from — but not all Montessori schools are the same.Knowing what to look for in a Montessori school can help you choose the best, highest-quality Montessori education for your child. One of the most obvious signs of a high-quality Montessori school is their official recognition and membership in a professional Montessori organization, like the Canadian Council of Montessori Administrators (CCMA). The CCMA sets standards that Montessori schools must adhere to in order to become members. As Montessori education operates within the private school system, any school can call itself a Montessori school. Choosing a school with the proper accreditation will help you identify the schools that adhere to the Montessori philosophy. Before choosing a school, you should always do a school visit. Arranging a school visit can help you see the school in action and see the classrooms and how they are set up. Look for classrooms without desks but with group activity spaces, rooms that are clean and well organized and where everything is accessible to the children. A good Montessori school will have well-defined areas for practical life skills, sensorial skills, math, language and the arts. The outdoors is another important part of Montessori teachings so be sure to check out the school’s outdoor space. Montessori School of Wellington offers monthly open house events throughout the school year. Contact us for dates. The role of the Montessori teacher is not exactly the same as a teacher at a public school. 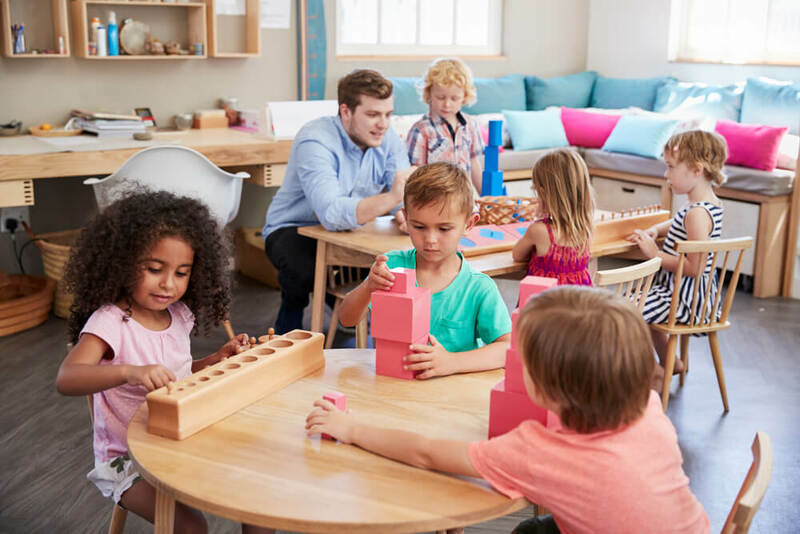 Montessori teachers engage with students in small groups and individually and spend a large part of their time observing their children and their progress. Being a Montessori teacher requires peaceful and courteous communication. We recommend spending some time talking to the teachers to determine whether they meet this criteria. A good Montessori school will also have Montessori-trained teachers as well as Montessori-trained assistants. To learn more about how a Montessori education can help your child grow or how our school could be the right choice for your family, don’t hesitate to contact us.